Despite Athanassoulas’ victory, his second career win in FSTi and coming soon after a P-WRC victory in Greece, Patrick Anglade (21) and new co-driver Peter Loth remain at the top of the standings thanks to their third place in the tried and tested Fiesta ST. While Craig Breen (19) and co-driver Gareth Roberts (21) did enough to maintain their challenge for a hat trick of FST titles this year, ultimately taking fourth place. A lack of asphalt experience did not stop Team Abu Dhabi’s Ahmed Al Mansoori (22) completing an impressive fifth-place finish with co-driver Killian Duffy (26) in the Fiesta ST ahead of Castrol Ford Team Türkiye Emre Yurdakul’s Fiesta R2. Majed Al Shamsi (29) and co-driver Allan Harryman completed the finishers in seventh, another good points haul for the Team Abu Dhabi driver. Athanassoulas and co-driver Nikos Zakheos got the best possible start to their rally, taking victory on SS1 by five seconds from Breen with Yurdakul grabbing third place on the damp, slippery roads of the Tarragona region to the north of Rally HQ in Salou. Despite developing a brake problem, Athanassoulas further stretched his lead on SS2, with Breen second, ahead of Anglade in third. After his strong start, Yurdakul understeered off the stage, putting him out of the day’s action and earning a 25 minute SupeRally penalty. The battle for supremacy raged on in SS5 with Athanassoulas taking the win with Breen and Martin completing the top three. But it was the end of the rally for Çetinkaya (28) and co-driver Çiçek Güney (27) who rolled off the road sustaining significant damage to their new Fiesta R2. The last stage of the day proved a tough one for Al Shamsi who came off the road, surviving a 25 metre drop. The damage was repaired by his team under SupeRally conditions, incurring a ten-minute SupeRally penalty. It was Breen who ended the day on a high though, taking the win on SS6 ahead of Athanassoulas and Martin to take a 3.1 second lead over his nearest rival into Day 2 an impressive feat after electrical problems had hindered performance for the afternoon. Yet another stage win for Breen ahead of Athanassoulas and Martin on SS16 showed that he would have been well in contention for the overall win had it not been for Saturday’s error. The Irish teenager followed with victory on SS17 ahead of Athanassoulas, the eventual victor, and Yurdakul in third. On SS18, it was Yurdakul that prevented Breen from taking a clean sweep of Sunday’s stages, coming home ahead of Martin and Anglade as Athanassoulas and Breen both had heart-stopping spins within sight of the finish. The result from Rally de España now means that Anglade and Breen are locked in battle for championship honours and the pressure is on both drivers for Rally GB in just three weeks’ time. "It has been a great rally for us in the end. We had some problems with our brakes but it didn’t affect us too much and it was great to be concentrating on our battle with Craig Breen. When he had his problem on Saturday, that meant that we could cruise a little bit, but overall this was much more competitive than my last experience of FSTi in 2006. Three years in the P-WRC have taught me a lot so I know how to judge my pace against such tough competition as Craig [Breen]. The Fiesta R2 is an amazing car and this rally has demonstrated that it is easily the top car in its class. It needs a few small improvements, as would be expected with any new car, but it’s very forgiving and the package is excellent. It would have been great to have a day of testing before the event but overall I am very pleased with the performance." Lambros Athanassoulas (GRE) – brake problems early on caused him to lose time, leading to a spin on SS3. The problems continued throughout the rally, but, after Breen’s error on Saturday, the Greek was able to preserve them more on the closing stages. A near perfect performance was only blotted by a 50 second penalty for exiting service late on Saturday midday after an error by the team. He picked up a puncture five km from the end of SS12, but was able to finish the stage before changing the wheel. A brilliant performance with no prior testing of his new Fiesta R2. 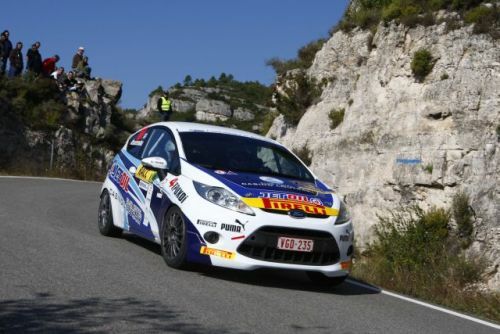 Anthony Martin (BEL) – has limited experience in the Fiesta R2 and struggled to find rhythm on the unfamiliar, wide roads of the Tarragona countryside on Friday morning. Not used to the speed of the R2, he found that his pacenotes were too slow in places. But a better Day 2 saw him adapt to the car and the conditions and post some impressive times. Enjoying a relatively trouble-free rally, he did have to tape his windows closed because of a problem with the opening mechanism on Saturday. The Belgian also incurred a 40 second penalty when delays on the road section saw him arrive late at SS15. Patrick Anglade (GER) – the championship leader banked on the reliability of the Fiesta ST in the hope that the new R2 would experience teething problems, which, unfortunately for Anglade, never materialised. After a steady start on the slippery roads on Friday, he pushed hard to gain some strong stage results whilst trying to protect his tyres on the abrasive surface. He suffered a set-back on Saturday afternoon after an anti-roll bar linkage broke on SS10 leading to tricky handling for the rest of the stages of the Leg. Another consistent performance from the German keeps him at the top of the FSTi standings. Craig Breen (IRE) – lost time throughout the rally due to an intermittent electrical problem, which was eventually solved on Day 3. Despite this, his challenge was ended by an accident 23km into SS10 as he misheard a pacenote and hit a rock face. Breen missed out on a clean-sweep of stage wins on Sunday after spinning on the final stage, but is still firmly in contention for the FSTi title. Ahmed Al Mansoori (UAE) – with no previous experience on Tarmac, Al Mansoori proved that he is a fast learner, producing a string of consistent times over the weekend to take a good points-scoring finish. He ran into problems on Saturday afternoon, breaking a drive shaft after getting caught in a deep cut, losing around one minute, but recovered well to come home as the best of the Team Abu Dhabi entrants and the second Fiesta ST.
Emre Yurdakul (TUR) – his challenge for a podium place was effectively ended as he crashed off on Day 1. With a heavy SupeRally penalty of 25 minutes, he returned to the action on Saturday but suffered brake problems, which slowed his progress. With testing planned on gravel in the Fiesta R2 ahead of Rally GB, he will be looking for an improvement at the final round in Wales. Majed Al Shamsi (UAE) – a string of problems began on Friday morning as he missed a gear, damaging the gearbox. His difficulties were compounded as he slipped off the road on Friday afternoon. Despite a cautious start to Saturday, his left driveshaft broke at start of SS12 and he lost around six minutes. Bader Al Jabri (UAE) – lost time on SS3 as intercom problems prevented him from hearing Steve McAuley’s pacenotes for 70% of the stage. Bader demonstrated great potential on Tarmac, his preferred surface despite limited pre-event testing. On Day 2 gearbox problems in the morning left him struggling to select second and third gear. He showed good pace on Saturday afternoon, but, just after SS12, his driveshaft broke, forcing him to limp back to service. Renewed drive problems on the first stage of Day 3 ruled him out of the rally. Burcu Çetinkaya (TUR) – Suffered the worst possible start to her rally when she was awarded a one-minute penalty for arriving late at the opening stage and then bent the steering arm after hitting a rock on the very first stage of the day. The damage from her SS5 crash proved too significant to continue.